The Fiends have taken over YouTube! 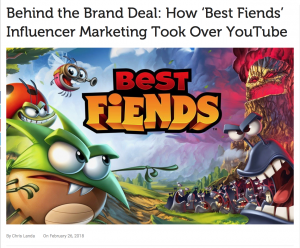 Chances are, if you’ve been anywhere on YouTube lately, you’ve seen Best Fiends in videos. That’s because Seriously has worked with your favorite influencers from RoseEllenDix to Markiplier and many more to create over 2,000 pieces of content. Philip Hickey, SVP of Brand & Marketing for Seriously, recently shared his insights on how the company approaches influencer marketing with Tubefilter. You can learn more about Seriously’s successful influencer marketing strategy here.